Laura Berg is a three-time Olympic gold medalist and coach. She is a member of The Church of Jesus Christ of Latter-day Saints. Berg was born on January 6, 1975. She earned her bachelor’s degree in recreation and leisure studies from Fresno State in 1998. She is a four-time All-American. Berg graduated as the school career record holder in hits, triples, runs and stolen bases, of which she still owns all crowns except stolen bases. Fresno State retired her number in 2015. While at Fresno State, she joined the United States Women’s Softball National Team. She is the most decorated USA Softball Olympic athlete in history, accumulating 11 total medals (10 gold) while competing in the U.S. Olympic Games, the International Softball Federation Women's World Championship and the Pan American Games. 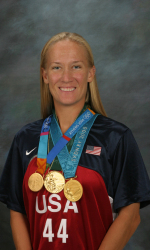 She is one of four women athletes in USA Softball history to compete in four different Olympics: 1996 (Atlanta), 2000 (Sydney), 2004 (Athens)—winning a gold medal at each—and 2008 (Beijing)—where she won silver. Softball was an Olympic sport from 1996 to 2008. She is head coach of the Oregon State Beavers softball team.